I couldn’t sleep. The long hike in to Marbata, the celebration, the runway inspection, the pig feast and the icy bath in the stream were all behind us. It was night now. I was bone tired and desperately ready for sleep. 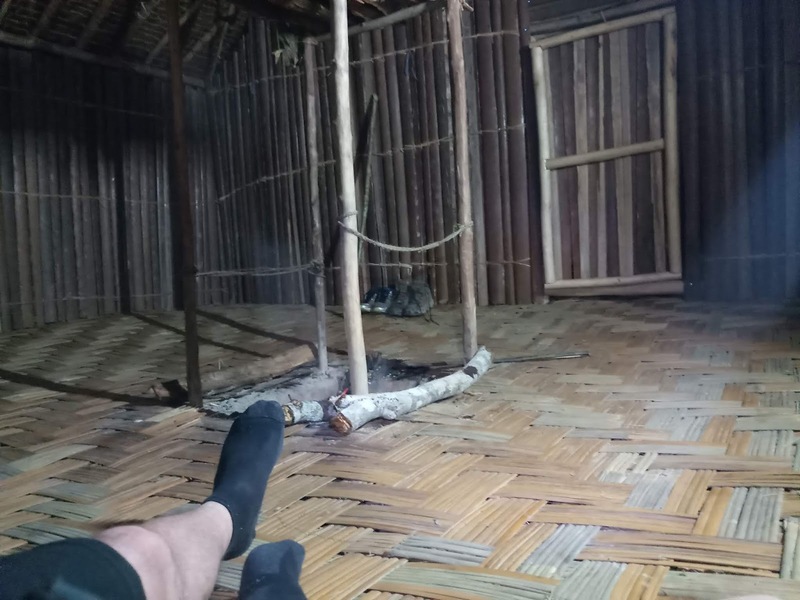 I had a decent sleeping mat and the woven floor of the hut had enough spring in it to be comfortable, but the rhythmic beat of the dancers’ feet outside the door and the cadence of their chants kept my brain from shutting down for the night. That, and the embers in the fire pit in the center of the hut were making it uncomfortably warm. 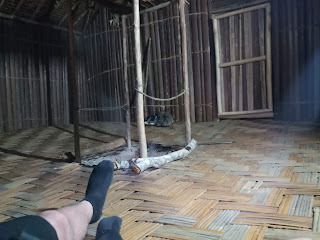 I glanced over at Mark, the only other occupant of our sleeping quarters—he appeared to be dozing soundly under a mosquito net. Thinking uncharitable thoughts about Mark, the dancers and the embers, I stripped down to my boxers and once again shut my eyes. The only photograph I took of the hut that night. Fire pit in the center of the floor. Time passed, and sleep still eluded me. I heard some rustling and figured Enos had come in for the night—I knew he and another companion from the hike were going to share the hut with us that night. Some time later, still unable to sleep, I rolled over and in the process must have accidentally jostled open my heavy eyelids. In the glow of the fire pit I could make out a stunning image: a group of men, seated in a semi-circle around me. 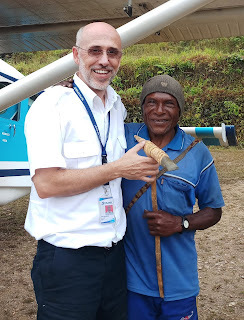 Demi, a long-time friend who helped with the New Testament translation for his Ketengban people, explained that these men were the elders from three distant villages. 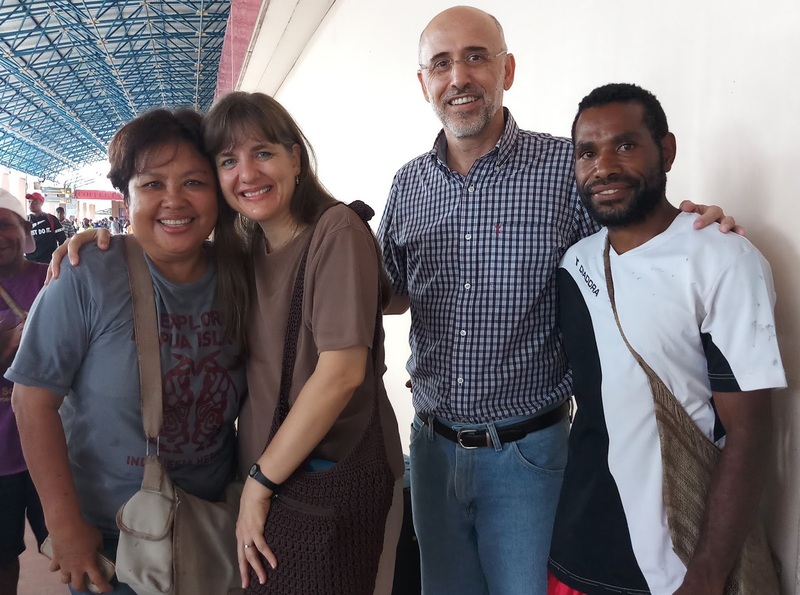 They had hiked through the mountains—some of them had been on the trail for days—to get to Marbata because they had heard through the jungle grapevine that Mark and I would be here. One by one the elders made their case, pleading with us to come to their villages and open the runways their people had built. I listened to these dear men speak with earnestness and humility. When it was time for me to speak, I wished that I could promise them something. All I could do was attempt to convey how much our team cared for each of their communities, but what a huge undertaking opening each new runway was for us, and how limited our capacity was as a team. We talked deep into the night. 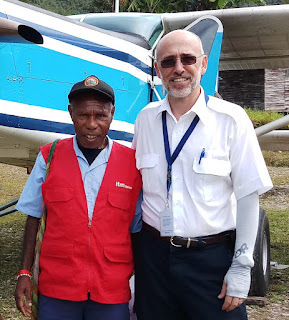 Eventually we spent some time praying together, asking the God we all worshipped to make a way for their runways to be opened and their communities to begin to benefit from the ministry of the aircraft. Each man then filed past my sleeping mat and we shook hands before they slipped out the door into the night. I looked over at Mark’s corner of the hut. He was still dozing peacefully. More uncharitable thoughts. With Demi, a few weeks after the night in the hut. I write this sitting at a kitchen table a world away from that hut deep in the Star Mountains of Papua. 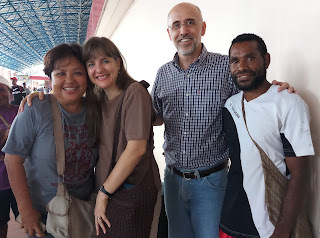 Sheri and I miss many things about living and ministering in Papua, but near the top of the list has got to be the opportunity to fellowship with dear believers like those men in the night. Believers who, though so radically different than us, love the same Lord and inspire us with their patience, endurance and joy in the midst of lives much more difficult than our own.